This week Michael has suggested The Heartbeats’ “The Sun Won’t Shine”. 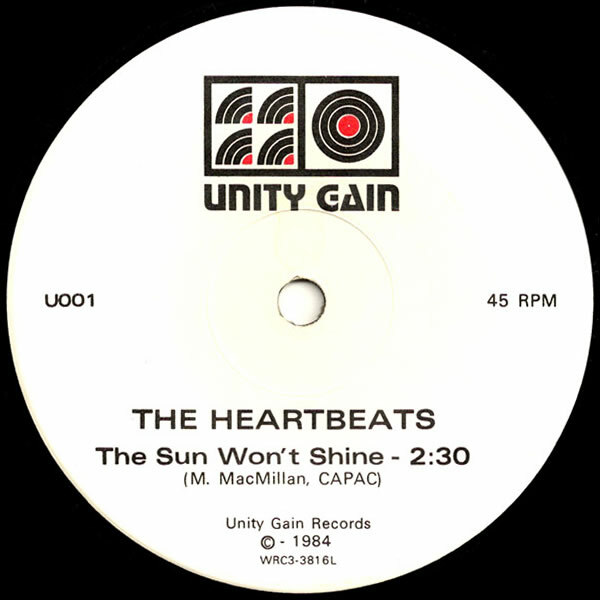 According to a few web pages (such as this and this and this and this), The Heartbeats were a band from Halifax, Nova Scotia, Canada, and the 7″ single of “The Sun Won’t Shine” (with “She Won’t Talk” as the B-side) was the only thing they ever released. 0:00-0:07 – This is a very pleasant way to start a pop song. To me, this is the sound of The Shadows as a skinny-tie band. 0:07-0:15 – And a very pleasant tune to begin the verse. Incidentally, although I’m finding this all very pleasant, the singer sounds a little nervous to me (e.g., 0:12-0:15). Hmm. I have a nagging feeling that I’ve heard the verse’s principal melody (0:07-0:11, “Watch that smile, if you’re going out…”) somewhere before. 0:15-0:19 – This bit of the verse is very Marshall Crenshaw. Yum. 0:19-0:22 – The rest of the verse before the chorus, and I found it the least interesting part of the verse. Ah well. 0:22-0:37 – OK. Here’s the chorus. And it sounds like it belongs in a country song. I really want this to be in a country song. All it needs is some pedal steel, maybe a bit of banjo here and there, and I’ll be going “Oh yeah, this is a nice country song”. Here’s another “incidentally”, but incidentally… the melody from 0:25-0:27 (“Again there’s always rain in my world”) sounds familiar to me. Have I heard that somewhere else? Oh yeah. That twangin’ guitar (0:36-0:37) leading into the next verse sound very country to me. Excellent. 1:05-1:09 – Songwritingly speaking, this is a dreadful transition from the chorus to the middle eight. Harmonically, the middle of this song is a mess. And the chords chosen at 1:20-1:21 to lead the middle eight into the guitar solo are even worse. 1:21-1:36 – Now that the songwriting nightmare of the previous 15 seconds is behind me, I can focus on the guitar solo. I like the guitar solo. It’s rudimentary and not ostentatious at all. But it’s twangy. Country! 1:36-2:06 – A double chorus. With a great country guitar fill (1:43-1:44). I like the lead guitarist. 2:06-2:24 – Another double chorus. We’re on the home stretch, folks. And the guitarist is making himself even more likeable by throwing in some country guitar fills (2:09-2:11). Then he plays some nice little melodies as the song fades (2:15-2:24). Lovely. Thanks, Michael. I liked your suggestion this week. You are currently browsing the archives for the Walker Brothers category.